Another interesting detail emerged from Google's agreements with its hardware partners. 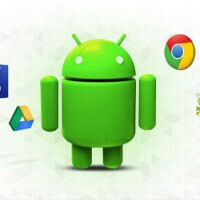 If you are an aspiring Android device maker and wish to include some of Google's ubiquitous apps for YouTube, Gmail, Chrome and the like with it, you are must consent to the MADA - Mobile Application Distribution Agreement. In short, the agreement asks you to include the complete Google Apps package and services, including items such as Newsstand and Google+. In addition, Google Search must be the default search provider, with the top-side Search widget and the Google Play Store placed, at minimum, immediately adjacent to the Default Home Screen. Also, other Google apps must be placed no more than one level below the Phone Top. As part of the contract, Google agrees to indemnify its partners for taking advantage of its apps.This is how Google partially covered some of Samsung's legal costs in the on-going patent dispute with Apple. Of course, vendors that don't insist on using Google's apps can simply opt for the open-source version of Android. This is what Asian manufacturers usually do, replacing the Google Play Store and apps with home-brewed alternatives. It has to be noted that these extracts come from a rather outdated, 2011 version of the MADA agreement. We can safely assume that these particular requirements are still a part of it, although we lack the concrete evidence to do so. Still, the existence of MADA isn't anything to hold Google accountable for, and its existence is hardly surprising. Such agreements are common practice within other software licensing companies to ensure their products are properly represented on contractors' devices. Microsoft, for example, does the same with Bing, which is the only search provider included on the majority of Windows Phones. More bloatware, people don't use a quarter of the supplied Google services so why even bother Google? The first thing i do when i get a new phone is freeze or uninstall crapware and Google+ is high on my list, had many problems with it even though i don't use it (wakelocks). Then get either an iphone (and see if you can uninstall Apple's apps that you don't need), a Windows Phone (and see if you can uninstall Microsoft's apps that you don't need, say that you don't want to use Office or Internet explorer...) or a chinese phone without google's apps and see if you can do without gmail, maps etc. Google must earn money, because it's a private company. They give away their OS for free, an OS which costs so much money to develop that you probably can't even imagine, and you complain because you have a couple of apps that YOU don't want? Well, use an alternative distro instead, like Cyanogen and the like. You'll be able to remove any app you want. But you cannot ask Google to provide you an OS for free, and to support it, without asking anything in exchange. Out of curiosity: what bloat ware apps does iPhone have and which ones you can't uninstall?! Stocks, passbook, healthbook, siri, facetime, compass, iTunes store. Then under settings I already see Twitter and Facebook crap, which needs to install the app to be useful. But I don't use either of those. Just to name a few apps I consider bloatware. Bloatware term has a precise definition, it is not what you consider to be. The word comes from bloat+ware. Bloat means excessive, not unwanted so what apps are like that on iPhone? Than what apps are like that on any other phone? When you'll answer my question I will too. Can you do that? If I look at a more defined version of bloated software (Software bloat is a process whereby successive versions of a computer program become perceptibly slower, use more memory/diskspace or processing power, or have higher hardware requirements than the previous version whilst making only dubious user-perceptible improvements. ), it's hard to tell which apps are really bloatware, but iOS 7 comes to mind. Sorry but I don't understand... Why do you think Siri is bloatware? Since Siri doesn't support the Dutch language, it's pretty useless for me and other Dutch people. Is it only for you or is it for the majority of iOS users? All Dutch speaking users.. And all other languages that are not supported by Siri. I am Dutch indeed, but there is a major difference in written English and speaking it fluently. Also ease of use would be my native language. Apple is all about ease of use. Google now support Dutch language, but very very limited. So I consider that bloatware for now as well. Sorry but a useless piece of software for someone does not qualify as bloat. I - and other billion people - don't use SMS; is SMS bloat too? Billion is exaggerated, but you asked me what I consider bloat. So... what do you consider bloatware on any phone. Not the definition but examples please. I forgot that carriers install apps as well in USA and true iPhone doesnt allow that, which I think is certainly a good thing. Also I do agree Android phones usually come with more crap on it. Question for you, do USA carriers allow buying a phone without a contract (and all their apps) and use it on their network? Just wondering if they do. I live in EU. But - and i know this thanks to PA - there is T-mobile or Virgin that do just what you asked for. Not complaining just said most people don't use the vast majority of the services Google bundles with Android. I already said i freeze and uninstall apps i don't need/like so why are you even bothering pointing me to a "alternative distro"? They make money through ads and i'm perfectly okay with those. +1 to you.. Well said.. People expect everything free from Google. But can pay for over-priced idevices. They want free OS with freedom, free apps, free play store support, free developer support.. Google is a company. It will try to earn. And I dont mind advertisements or google services that I dont use (It doesnt make much of a difference even if it is on my device coz 60% of google services/apps are used by a majority of people). And not all of the services are pre-installed on device. I guess mostly its gmail, play store, youtube, gmaps, google search, google music, chrome, google+, & hangouts which are pre-installed. Out of these, most people dont use google+, google music & hangouts. Other than that, all other services are used by maximum people. Well Facebook, uTorrent and Skype apps are one of the most battery eaters in the background and Shazam as well. Google+ is also quite annoying, but can be useful! The bloatwares I consider from Google are Hangouts, Play Movies, Newstand and YouTube! They just eat battery in background! As long as it's free with no restrictions, I don't mind ads or send my data as my personal stuffs are pretty boring and if someone finds it useful, I'll be happy for him. All the way as long as they don't abuse, I'm fine and Google does just that. They don't cross the limits where it will be harmful for us! If Google did not impose Gapps, we could have all kind of search engines installed full of useless options just like in Windows PC! And how can you tell those are battery users? I don't see them in my battery stats overview at all. Also.. I use hangouts, newsstand and Youtube, so I don't consided them bloatware at all. lol you must be one of a kind. Questions me why do you use android then? I made it real obvious up there, to uninstall and freeze bloatware be it from the OEM or Google, customize to my liking, installing custom ROMs and kernels. So you had one bad experience and then almost all Google apps were bloatware all of a sudden. I haven't seen G+ start or even show up on the battery stats even once.